On Day 3, we took a cruise to Molokini and Turtle Town and did snorkeling. I saw many sea tutles and swamed with them! After the cruise, we drove down to Black Sand Beach in Makena and swam in the ocean again. This is one of my favorite beaches in Hawaii, and there were just a few other people besides us that day. So, it was like our private beach! After coming back to our hotel, we swam again in the hotel's swimming pool and had some cocktails. Since we were staying such a lovely hotel, Wailea Beach Marriott Resort, we decided to stay and join the Luau dinner for the evening. Some local people we talked to earlier told us that Wailea Marriott does the best luau dinner and we should definitely check it out. They were certainly right!! The event started in the early evening with the live music. Before the dinner, we all enjoyed watching the sunset over the ocean. 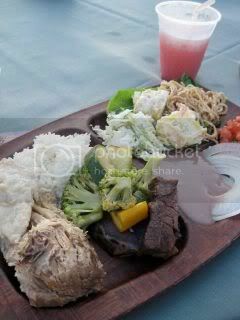 The dinner was really great especially for a "party buffet" food! One of their main features is the kalua pig, which is cooked in the traditional imu (underground oven). I loved the combination of the kalua pig, sliced Maui onions, and poi!! 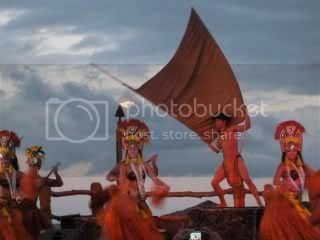 The show was the best luau show I'd ever seen. The fire dance finale was so breathtaking. The fire dancer has been the international fire dance champion for 3 years in a row! Truly amazing! !